After building his first race cars out of southern Louisiana junkyards, Bob Riley quickly established himself as a leading light, if not genius, when it came to race car design. His first major suspension design helped Henry Ford II make good on his vendetta to beat Enzo Ferrari at Le Mans. Riley's first radical Indy car designs with its ingenious center hub mounted suspension resulted in A.J. Foyt's landmark fourth victory at the Indianapolis 500 in 1977. 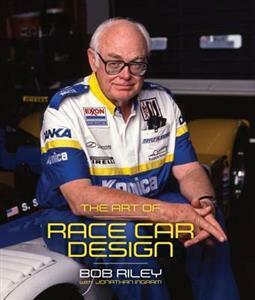 Since then, Riley has continued to be at the heart of the world of motorsports, working with its most famous drivers at the biggest events, including the Daytona 500, where his engineering helped Dale Earnhardt finally win NASCAR's marquee event.Americans love the "genius" angle like everyone else. They love winners. Sports stars are overtaking Hollywood these days in popularity. Racing readers are a small but predictable group and suspect the generation familiar with Bob's exploits at Indy would be keen on a book like this. They're the same age group pumping up the vintage magazine market and the collectible car market. Bob Riley is a veteran designer and builder of race cars.Jonathan Ingram is an xperienced motorsports jounalist covering motorsports since 1976.